The Special Olympics are underway in Adelaide. It’s a celebration, but one with an undercurrent of frustration. Charlotte Grieve reports. Emily Shiell’s secret weapon is Vegemite spaghetti the night before a race. At age 11, the Vermont schoolgirl is the youngest athlete to qualify for the 2018 Special Olympics National Games. She is an all-rounder in sport and smiles under the haul of medals jiggling around her neck, recognising achievements in an array of sports. “Ever since she’s been able to walk, she’s been active and running around,” says mother, Sam Shiell. Emily takes after her mother, who was a competitive swimmer throughout her youth. She hides shyly behind Sam’s legs before confidently emerging to display her Special Olympics uniform. The young athlete’s learning difficulties have not stopped her from training daily in the lead up to the national games, and Special Olympics qualifiers, in Adelaide– her first national competition, and first trip on an aeroplane. Involvement in the Special Olympics has given her more than medals – it’s provided new friends and a sense of achievement. “I’m really happy to be a part of it,” she says. Emily is one of 150 Victorians who will compete this week in Australia’s eleventh Special Olympics National Games. The event, held every four years, comes in the wake of the closing ceremony for Commonwealth Games on the Gold Coast. These games marked a new high watermark in terms of the inclusion of athletes living with a disability. The integrated program saw para-athletes compete alongside mainstream events. Their wins contributed to the overall medal table for the first time, and excited passionate responses from sports fans, with wheelchair-bound Australian star competitor Kurt Fearnley saying the roar from the crowd when he won silver in the wheelchair 1,500m “almost blew my head off” . The para-program integration has been widely hailed a success, including from the likes of Usain Bolt, who described it as “brilliant.” But for Simon Rodder, sports development manager for the Special Olympics, there’s a sting in the tail, because the sporting community “still has a long way to go” when it comes to including athletes living with an intellectual disability. Athletes with intellectual disabilities have been locked out from competing in mainstream sporting events since 2000, after a controversial ban imposed by the International Paralympics Committee (IPC) following the Sydney Olympics. Players from the Spanish basketball team were found to have fraudulently claimed to have learning difficulties in order to classify for the para-Olympics team and went on to win a gold medal. Classifying impairment is a complex process where a balance must be met between fairness and inclusion. Rodder says that when it comes to wide spectrum of intellectual disability, the classification system is even further in the grey zone. After the integrity of the classification system was undermined, intellectually disabled athletes were banned by the IPC from competing, in a move widely condemned by human rights campaigners. He says this has not only had lasting effects on the opportunities available for such athletes, but has succeeded in further hiding and stigmatising intellectual disability. In 2012, the ban was partly lifted to enable athletes with a learning disability to compete in certain events in three sports – athletics, table tennis and swimming. But momentum on the issue is slow, and Rodder says the debate around assimilation versus integration “could go on for years”. Meanwhile, the Special Olympics provides an alternative playing field for athletes of all abilities. “It’s about giving athletes with an intellectual disability a chance to perform on a stage where they don’t often get to – big stadiums, big tracks, big pools,” says Rodder. Andrew Negrelli, 34, who has cerebral palsy, has been involved with Special Olympics since 2004, competing in basketball, tennis and alpine skiing over the years. 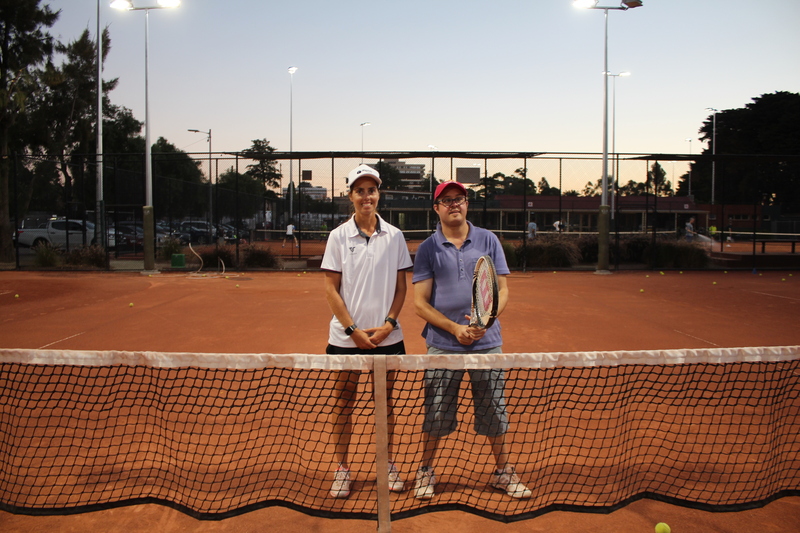 This week, he will be representing Victoria in tennis – a game he has played for 14 years. “I’m feeling ready, a bit nervous because it’s my first National Games. I don’t know what to expect,” he says. Depending on Negrelli’s performance this week, he could be travelling to Adu Dhabi for the 2019 Special Olympics World Games. That would be a sweet bonus, but the athletes agree that being a a part of the Special Olympics is about more than the headline competition. Regular training and social events are clocked for around the year. “Our point of difference with mainstream sports organisations is around giving athletes opportunities to develop outside of sport,” says Rodder. Last year, Negrelli represented the Special Olympics in Austria, travelling to 54 towns to carry the “Flame of Hope” – similar to the Olympic torch – with a retinue of 130 police officers as part of the Law Enforcement Torch Run. He has since been encouraged by Special Olympics organisers to become an inspirational speaker, regularly sharing his journey with crowds in the hundreds. For Michael Van Wilgenburg, 22, the games have given him friends from across the world. This year, he will serve as the Victorian Ambassador, providing a role model for the athletes. People with intellectual disabilities are marginalised from mainstream society, hidden from view, Van Wilgenburg says. He sees the Special Olympics as an opportunity to put them in the limelight and raise awareness about what it’s like to live with an intellectual disability. Tim Paine trudges off after being dismissed, while India celebrate his wicket. Stay up to speed on the latest news and events at The Citizen.